I seem to have picked just the best week in the world to take a week off from work and the blog... My apologies for not posting something about my absence earlier. Well, the biggest news of the week is that Kari Lehtonen is healthy and Richard Bachman has won the backup job behind the big Finn. This means that Andrew Raycroft is coming to Texas. He cleared waivers this morning and will join the team in Abbotsford. I don't think he steals the starting job from Beskorowany. Why would you place him above Besko on the depth chart at this point when it is clear that he is not in the future plans if GM Joe in Dallas? That said, Texas goalie Beskorowany could use a veteran presence to help him mature as a tender and Raycroft can provide that. In other news, Texas posted their first come from behind win on Tuesday night thanks to a little OT. The sellout crowd saw one of Texas's best efforts of the the season in this regard. It helps, of course, when the deficit after 40 minutes is only 1 goal. Texas plays two in Abbotsford to round out the year. I will be back in time for the New Year and home contests against the IceHogs next weekend. Big news for Abby is that Leland Irving is still with Calgary. He was a big reason the Heat took both games in the CPC earlier this season. In just 68 seconds in the second period, Ryan Garbutt pushed the Texas Stars past the Houston Aeros with two goals. Hubert Labrie scored his second of the year in the period as well. This is a big two points for the Stars, who start their holiday break on a high note with the W. Tyler Beskorowany finished with 27 saves on 29 shots. It was Houston striking first in this one with Chad Rau scoring immediately off the faceoff win from Jeff Penner 7:58 into the first. Texas outshot Houston 11-9 in the period. The end of the first had a bit of a scare for Texas as Jordie Benn had to be helped off the ice following a hit from behind by Kyle Medvec. Benn returned and started the second period. Texas had a monster second period with three goals in the frame to lead after 40. Hubert Labrie collected his second of the year, blasting one past Matt Hackett at the 8:31 mark of the period. Matt Fraser assisted on the play and extended his point streak to eight games with the helper. A flurry of scoring ended the period. With Texas on the power play, Cody Almond got a breakaway goal as the puck bounced off the Spang's skate at the blue line. The 2-1 lead was shortlived for the Aeros. Ryan Garbutt scored on a beautiful pass from Mike Hedden just under one minute later to tie things at two. Garbutt wasn't done though, scoring another off a rebound from a Colton Sceviour shot 68 seconds later. The forward's fifth and sixth goals on the season put Texas ahead of Houston 3-2 after the second period. Houston went bombs away in the third period, outshooting Texas 7-1 through the first 15 minutes of the period. The Aeros kept pushing through the third as Hackett left the net for the extra attacker with 75 seconds left. Ultimately, Texas was outshot 9-1 in the period, but emerged victorious. Texas is now off until next Tuesday. Tonight the Stars travel to Houston to face the Aeros yet again for the 7th meeting this season. Texas will face defending Western Conference champion Houston 12 times on the year, a present from the AHL schedulers to Stars fans. I guess fans have been naughty. Texas is 2-4-0-0 against the Aeros this season as they continue their dominance in the West Division. Only OKC has more points than the Aeros this season (44), yet the Aeros are ranked #4 in the conference due to divisional seeding rules. This is a very good team. Additionally, it is a team that is finding ways to win despite massive numbers of callups to the NHL. Matt Hackett has been superb behind the pipes at 10-4-3. The only weakness in Houston's game is their record past sixty minutes. Houston is 0-for-7 in the shootout. If Texas can get that far, they have a shot. Also, each team has a very good record when leading after two. Shut it down and head home after 40 between these two teams. Captain Jon DiSalvatore leads the way with 10-14-24. Jeff Taffe isn't far behind at 5-16-21. The Aeros come into tonight's game on a two game losing streak, dropping an SOL to OKC on Saturday and a regulation loss to Rochester on Sunday. Until the most recent game for these two teams, the away club had won each time. Texas hopes to reinvigorate that trend with tonight's game. Keys to game will be winning each shift. Texas has to take it one shift at a time against such a talented team. In addition, if early or "bad" goals do happen, they need to rally together as a group, forget about it and move on. This team has had a tendency, self-admitted, to get down on themselves when they fall behind by one or two early and take themselves out of the game mentally through that. Maturing as a team will be a key element to beating a playoff-hardened Houston roster. After last night's offensive outburst, Texas couldn't get past two goals again tonight despite a total of 48 shots on net. Coach Pyle has talked about Texas's lack of finish before and tonight's game showed it. As he has said, you can't take almost 50 shots and not score more than two. Tyler Beskorowany took the loss with 29 saves on 33 shots. San Antonio opened the scoring early with Bill Thomas scoring his 8th of the year just 3:11 into the game. The shot was redirected off a pass from Mark Cullen. SA put themselves up 2-0 with a goal from Bracken Kearn with six minutes left in the first. Thomas got into the action again with a centering pass from behind the net to make the play happen. The Stars got into the scoring in the second with Ondrej Roman's first goal of the year. The tally came as Roman intercepted a San Antonio pass and snapped it to the net quickly. The Rampage scored just under one minute later to regain their two goal lead. Thomas tipped a point shot from Cullen again for his third point of the night. Texas poured it on in the third, outshooting SA 20-7. They only managed one goal, while allowing a Rampage marker. The only goal of the period for Texas came with nine minutes left as Matt Fraser scored his team leading 14th of the year and extended his point streak to seven games. With time winding down, Mark Cullen snapped one past Beskorowany on an open look as Texas was preoccupied with the offensive side of things. Texas and San Antonio finished without a power play goal for either team. Texas had 4 opps to San Antonio's 2. Texas plays again on Wednesday in Houston in their last action before the Christmas break. The top line finished a combined minus-8 tonight. The defensive play of the unit has been a going concern on the season. Fraser and Sawada (injured) are each minus-11 on the season and Travis Morin is minus-10. Ryan Garbutt, who subbed in tonight in Sawada's place, is plus-4 overall even after tonight's minus-2. Coach Pyle clearly sees that the line has scoring potential, but that they are also a defensive liability. How do you keep that line's offense clicking while also bringing up their sagging defensive? The Stars move from a team they've only played once to one of their most familiar opponents in the San Antonio Rampage. The Rampage are on a bit of a tear with three straight wins and a 6-4 record in their last ten, setting them just one game under .500 on the season. Texas is in a similar spot. Today's winner will even up their record with the Christmas break on the horizon. This is the third game in as many nights for Texas while the Rampage got Saturday off. "I think the guys are ready. In your division, it's a short trip so there should be no excuses. You can't say 'We're tired', you just play smart, keep a guy high and bury your opportunities"
"The San Antonio Rampage played their best game tonight, despite being out-shot 45-23. Jacob Markstrom played his best game in San Antonio, allowing just one goal, and saved 44 shots. As impressive as Markstrom was, the offense got the game started with a three goal first period. Tyson Strachan scored his first goal of the season to open up the game, with Greg Rallo, Scott Timmins, and Bracken Kearns scoring the other goals. The Rampage won back-to-back home games for the first time this season." If you'll remember, offense was a bit of a struggle for the Rampage early in the season, as they were leaky in net and didn't have the goals to compensate. Now that both are clicking, they are trending upwards in the standings. Bracken Kearns leads them in scoring with 9-9-18, followed closely by Colby Robak at 5-10-15 and an impressive plus-15 rating. In net, it's been a carousel for the Rampage. Dov Grumet-Morris and Jakob Markstrom currently man the pipes, though four other masked men have started for the Rampage this season. Grumet-Morris, a recent AHL contract signing, is 4-1-0 on the season with a 1.59 GAA and .936 SV%. Markstrom's record is a little more battle-worn from the early season, 4-5-0 with a 2.61 GAA and .911 SV%. One player Texas will not be seeing is Greg Rallo. The former Star is expected to play in his first NHL game today against Carolina. He is the second Panther to get his first NHL game at the age of 30 this season, the other being Bracken Kearns. Texas got their W tonight over the Rochester Americans but not without a little bit of a scare. After allowing two goals on the first three shots of the evening, Texas roared back and scored six unanswered tallies including two shorthanded goals. Jimmy Spratt collected his first AHL win in his first AHL start this evening, stopping 14 of 16 shots against. "We got some bounces, buried our chances and got our lead," said Ryan Garbutt, who had 2 goals and 2 assists on the night. "We're a pretty good team when we're playing with a lead." Texas gave up two early in the contest to set them behind quickly. Three minutes in, Texas was stuck with a defensive faceoff after icing the puck on a long shift. Rochester won it and Brennan sniped one from the point past Spratt for a 1-0 lead. "That first shot was a laser," said Coach Pyle. "Through a screen off a one-timer." Thirty seconds later, Texas left a man uncovered in the crease to go down 2-0 just 3:41 into the contest. "We were right where we usually are," joked Coach Pyle. Good thing for Texas that Rochester hasn't scored more than 2 goals in nine road games this season. Late in the first with Max Fortunus in the box, some clever forechecking work by Travis Morin and Ryan Garbutt got the Americans flustered and allowed Brenden Dillon to sneak down from the point and snap home an easy rebound goal for his second of the season. The shorthanded tally was Texas's third on the season. The Stars closed the period at a 2-1 deficit. The second period was where Texas came alive. Brad Lukowich opened the onslaught, jumping into the play down the left wing side and snapping home his first goal of the season. Garbutt and Fraser assisted. Garbutt got one of his own a few minutes later with a great shot over MacIntyre's left shoulder from the circles. "That was my buddy in net, so it felt good to score a couple on him." Francis Wathier earned Texas the lead with the ultimate game winner, another shorthanded tally with 4 minutes left in the second period. Wathier's 6th of the year was assisted by Dillon. Mike Hedden got into the action as well with a breakaway goal on MacIntyre that set the score at 5-2. Ryan Garbutt added his second of the night and fourth point overall in the third period, splitting two defenders and beating the goalie five-hole. Texas shutdown the Rochester attack in the second and third. "It was team effort and team dedication in our own end and it was great to see," said Garbutt. Of the success of the penalty kill, he added: "Everyone is sticking to what they do. It's nice to get goals on the penalty kill like that. To get shorties like that is really uplifting." Coach Pyle commented positively on Garbutt's night. Pyle coached Garbutt in Gwinnett and that connection was actually part of what brought Pyle to Texas. "You knew at some point he'd have a game and break through," said Pyle. "I'm really glad for him." Neither team scored a power play goal in the contest. Texas held Rochester to just 16 shots. Texas finishes their three in three tomorrow with a game at San Antonio. Luke Gazdic got a misconduct in the third for Rule 75.4, likely subsection (iii), which assessed a misconduct for any player who persists in actions "designed to incite an opponent into incurring a penalty". Gazdic was attempting to get even with an Amerk forward to elbowed Hubert Labrie in the head on a race for a puck at the end wall. Labrie finished the game. Tonight, Texas plays the Rochester Americans for the first time in team history. Despite both being in the West Conference these past three years, Texas and Rochester never crossed paths. With realignment to move Charlotte west and Manitoba/St John's east, schedules were shifted to make each team play every other in their conference. The Americans (often abbreviated Amerks) are a storied franchise. They are second only to the Hershey Bears in terms of tenure in the league, entering in 1956, and have six Calder Cups, most recently in 1996. Traditionally, the Americans have been affiliated with their NHL neighbors to the north, the Buffalo Sabres. In 2008-09, the Florida Panthers became the sole affiliate of the Americans, which led to much consternation by the Amerks fans. They felt that the Panthers did not provide the AHL team with the quality roster necessary to be competitive in the league. After three seasons of that affiliation, Rochester reaffiliated with Buffalo and Florida moved on to San Antonio. This year's iteration of the Amerks has been plagued by injuries in Buffalo, causing callups of some of their top players including Zack Kassian, Paul Szczechura, Colin Stuart, Corey Tropp. Beat writer Kevin Oklobzija opines on Twitter: "Just not enough AHL-quality forwards in the #Amerks lineup now." Derek Whitmore, a long-time Buffalo system farmhand, leads the team in scoring with 12-6-18. The next active player is Mark Voakes at 2-12-14. Other notables include Rob Bordson, who went to training camp with Texas and was later signed with the Trenton Titans. He has no points in four games. Rookie Joe Finley is your PIMs leader with 69. In net, the Amerks have a familiar face for Texas in Drew MacIntyre. MacIntyre, previously of the Bulldogs and Wolves, is 4-8-1 with 2.60 GAA and .918 SV%. David Leggio is the 1A of the club with 7-7-0 record, 2.91 GAA and .902 SV%. Leggio is on a two-way to Buffalo and has been bouncing around the pros since 2007 with previous stops in Binghamton, Albany, Portland, Florida (ECHL) and TPS Turku (Finland). The Amerks possess the worst road record in the AHL at 2-7-4 and have been outscored 45-30. They were beaten in San Antonio last night in OT, a stinging loss to some former Amerks. "This has been a tough two years for the Amerk franchise. Last year, it seemed an Amerk forward or defenseman was going to South Florida because a member of the Panthers had gotten hurt. Now, injuries are seemingly an every-night happening for the Sabres. As a result, the Amerks send a team that’s under-manned in terms of AHL talent to Texas for three games. One win would be an accomplishment. Even just stretching a game or two to overtime and garnering the “loser” point might be an acceptable outcome. This team has averaged fewer than two goals on the road in the past nine games. Expecting anything to change would require the rosiest of rose-colored of glasses ever made." On Texas's side, well, it's about the W. Texas needs to get back in that win column after the promise of the previous few games. Jimmy Spratt could be your starter tonight as well. I'll try to get more information on that as the day wears on. After a strong game on Tuesday against the league-leading OKC Barons, Texas had a rough game against the Houston Aeros tonight. Really, the game can be honed down to the first 5 minutes of the second period. Texas actually outshot Houston in the second 17-7 but was outscored 2-1 thanks to those first five minutes. The Stars now return home to play the Rochester Americans in Cedar Park. The recently reliable Texas PK let them down early as Houston opened the scoring on the power play with Chay Genoway getting his second of the year. His goal, assisted by Ortmeyer and Foucault, was the only scoring of the first period for either team. Shots were in Houston's favor 14-10. The opening minutes of the second period were where things fell apart for the Stars. Just 89 seconds in, Matt Kassian notched his second of the year and second in as many games. The tally was assisted by Taffe and Bagnall, who have both spent some time in Minnesota this season. Three minutes later, Fontaine generated an impressive tally, passing through three Stars to find Joel Broda who banged it home to make it 3-0. Texas got their first power play of the night just under halfway through the second. Matt Fraser got the PP unit off the schnide with his 13th of the year, Texas's first PPG since December 3rd in Charlotte. The period would end with the 3-1 score in tact for the Aeros. Texas outshot the Aeros 17-7 in the period but couldn't beat Matt Hackett more than once. Texas is winless on the season when trailing after forty minutes. Tonight's game would be no exception. Houston added a fourth goal from Chad Rau on a patient play by the Aeros forward. The gauntlet continues for the Texas Stars this evening as they face the #4 team in the Western Conference (#2 by points), familiar foe the Houston Aeros. Texas has played the Aeros the most of all AHL opponents, 30 times in 3 years. Houston owns the all-time series 16-10-3-0. This year, Texas has played 5 games with the Aeros, going 2-3-0-0. Texas is riding high off a win against the league leading Barons on Tuesday night. They need to focus their efforts for this game against the Aeros, who have failed to collect a point in only four games of 27 this season. Part of that equation should be the Texas power play. Still highly ranked in the league thanks to a hot start, it has sputtered as of late. The club has failed to register a PPG since their December 3rd game against Charlotte, a streak of 19. At the same time, once a liability, the penalty kill is humming. Texas was ranked in the bottom 2 for the early season but has now surged to 9th with an 83.5% kill. In their last 50 penalties, they are 92%, contributing to the surge. The Aeros are worse in both categories (18th ranked PK, 20th ranked PP); special teams are where the Stars can really hurt the Aeros. While Tyler Beskorowany will probably get the start tonight, Jimmy Spratt will have to get one this weekend in all likelihood. There are arguments to be made for both of the next two games. Rochester will be a home game, which is a good place to get your first start. The Americans are in the playoff picture though, so they could be a rough first start. The Rampage are similarly mired with the Stars toward the bottom of the conference. That could be a good start but is on the road. Coach Pyle has a decision to make that isn't an easy one. Minor transaction news today with Jake Hauswirth being recalled to the Texas Stars from the Rio Grande Valley Killer Bees. The right wing was part of the trade that sent Krys Barch to Florida. It is a bit confusing that he would be brought up, since Texas is alternately scratching Stephen Schultz and Eric Godard and would not likely like to add another body to the press box rotation at this time. Best indication is that Texas wants to get a feel for what they have in Hauswirth in case of the need for later recall. Texas has only a few forwards in the ECHL/CHL level so it would be good for Coach Pyle and GM White to know what they have in Hauswirth, how he fits with the team and what his strengths are, just in case. I would not expect him to dress for any games this weekend. In other news, Richard Bachman's shutout performance in MSG earned him the start tonight against the NY Islanders. This will be Bachman's third straight start in the NHL, previously winning at LA. The Texas Stars announced on Thursday that the Dallas Stars have reassigned right wing Jake Hauswirth from the Rio Grande Valley Killer Bees of the Central Hockey League to the Texas Stars. The Dallas Stars are the NHL affiliate of Texas. The Dallas Stars acquired Hauswirth in a trade with the Florida Panthers on December 7. Dallas sent forward Krys Barch to Florida in exchange for Hauswirth and a sixth-round pick. The 6-foot-5, 215-pound right wing is in his third pro season, spending the first two pro years in the ECHL with Cincinnati and South Carolina. Hauswirth played in 19 games with the Rio Grande Valley Killer Bees of the CHL this season. The right wing has six goals and seven assists for 13 points in 19 games played. In all, the Merrill, WI native has played in 130 pro games, scoring 35 goals and totaling 75 points. I am sure that I am not alone among Austinites in feeling a little extra bit of pride last night as I watched Richard Bachman shutout the New York Rangers at Madison Square Garden. Despite what was ultimately an ugly grinder of a game, the goose egg remained for the full 60, and "The Biz" collected his first NHL shutout in just his second start. Commentators Ralph and Razor praised the "kid's" performance, calm and controlled with rebounds going exactly where they needed to be. For Texas fans, it was just another hum-drum performance, something that we have been treated to nightly for this season and last. In my estimation, Bachman is first truly impactful Dallas Stars callup that Texas fans can fully claim as their own. While others have been called, they either didn't or haven't yet made a huge impact (Gagnon, Vincour, Larsen) or couldn't really be called "ours" in the first place (Jamie Benn). This was the piece of the puzzle that Texas fans were missing in the AHL experience, and Richard Bachman has provided it. Take a look at some other rosters across the league. How many of those pesky Hershey Bears from the 2009-10 playoffs do you see now on the Washington Capitals roster? What about Admirals on the Predators' roster? There are many and that is because of their strong farm systems. Dallas has been, until recently, rather bare in the cupboard with regards to prospects and system depth. As GM Joe restocks, Texas is a major beneficiary as we get to see the future stars of the NHL play a season or two in Cedar Park before moving on. As those players move on, the NHL club is stocked more and more with former AHLers. Every time one of those forwards tallies a goal, defensemen lays a devastating check or goalies makes a fantastic save, you remember a fuzzy faced young kid who came through the farm system and did the same. This is the full AHL experience that Texas Stars fans have been missing. Richard Bachman is the first of, hopefully, many players who give Austin something special to be proud of in the NHL. Tonight in Oklahoma City, the Stars played arguably one of their best game of the season, beating the league-leading Barons by the score of 3-2. Texas did their damage in the first period with three goals in the period. Scoring came evenly from three of the four lines. The Stars limited shots against, allowing only 20 in the entire contest, which certainly helped matters. Texas opened the scoring three minutes into the first with the first professional goal from rookie Stephen Schultz. The Colorado College product collected his tally generating traffic in front with assists to Roman and Hedden. Hedden was moved to this line after a few games on the top line with Sawada and Morin. Six minutes later, Texas was up a man with a delayed penalty coming for the Barons. Dan Spang jumped over the board as the extra attacker. Texas setup a power play look with Sawada in front. He was rewarded as Brenden Dillon blasted a point shot that Sawada tipped past David LeNeveu. Sceviour had the Stars third goal of the period. Scott Glennie was down on the ice by the end of the play but Sceviour extended the Stars' lead to three with his third of the year. The Stars and Barons tied on shots in the period at eleven. Yann Danis would start the second for OKC. The Stars continued their dominance in the period but didn't beat Danis. Outshooting the Barons 10-2 in the period, Texas controlled the pace and led 3-0 after 40. It was a rough and tumble period for Texas with several Stars, including Wathier, needing minor attention from DJ Amadio, the Stars trainer. All returned to the bench and didn't miss a shift. The Barons would not go lightly into that good night though. Beskorowany needed to be sparkling including another "you've got to be good to be lucky" sprawling save early in the period on Triston Grant. Grant was involved in some nastiness halfway through the period as he sucker punched Brad Lukowich on the Stars PK. The ensuing 4-on-4 saw the Stars' give up a goal against. Taylor Chorney scored for the second time in as many games against Texas to make it 3-1. The Stars locked it up until the last second of the game. The Barons scored an ultimately meaningless goal with 1 second left. The refs didn't even both to drop the puck after the goal. It was over, and Texas came out on top. What a quality win for Texas. The team has to feel good about this win and they deserve to. This Tuesday morning finds the Texas Stars (10-12-0-1, 21 pts, #15 Western Conference) at the bottom looking up in the Western Conference standings. This week's slate of games wouldn't have you thinking that Texas is a last place team, however. They beat the #2 team in the conference in a 3-0 shutout and played tight with the league's top team only to lose 3-2. It's a cruel fate for the Stars, who are trying to grow together as a team and learn to finish while they are constantly beaten down by the three top teams in the league, who are all in their division. The Oklahoma City Barons (Edmonton Oilers), Houston Aeros (Minnesota Wild) and Abbotsford Heat (Calgary Flames) combine for 30 of 76 total games against the Stars this season. Coach Pyle talked a lot about finish in Saturday's postgame comments. "We need 50 shots to get 3 goals, and that's where we struggle. You're not going to win scoring two goals every night, you're going to need three and four." "We get shots, we're putting it to the net but we've got no finish. When you get opportunities, you've got to bury them." With Saturday's loss and the various moving parts around them, the Stars find themselves at the bottom of the Western Conference this week. To add insult to injury, they will play against the Oklahoma City Barons once again this evening, the top team in the league. Saturday's contest against OKC did not have the look of a first place against last place battle. That's really the troubling part about Texas's recent play. The Stars got two of three from Charlotte and had OKC in striking distance for much of the game on Saturday. This roster has a chance to explode at any point, but Coach Pyle notes that right now they lack finish. It doesn't help that Texas is in a division with the top three teams in the league, teams that they will play a total of 30 times this season: OKC at 39 pts, Houston at 38 and Abbotsford at 37. The deck is seemingly stacked against them in this regard. There is no time to develop "finish" because the team is getting the tar beat out of them by three teams that could easily be in the Calder Cup Final this year. The Rampage are even showing signs of life, winning three of their last five and five of the last ten. So where to go from here? Something that can be an immediate effect on this team is the power play. It has been statistically good if you measure the whole season, but has dropped off recently, going 0/6 on Saturday. One power play goal in that contest, and it's an entirely different look. Coach Pyle recently shuffled power play lines in Charlotte, giving Texas two there, but it was ineffective against OKC. The good news in all of this is that pesky "games played" number. Texas only has 23 games so far this season, tied for Milwaukee for fewest so far. Their win percentage actually places them in #13 and the #9 team (Peoria) is only a seven-thousandth of a percentage point better in terms of winning percentage. If Texas rattles off three of the next four, they are #8 in the conference. If they get 5 points in the next 4 games, they are back to .500 hockey. That's a tough task with OKC and Houston on the schedule this week, but it has to happen to keep this team competitive. As to the Barons, Texas is familiar with them from this week. Changes to their lineup include the exclusion of Josh Green, who was suspended yesterday and injuries to Linus Omark, Teemu Hartikainen, and Andrew Lord. In other news, Texas has recalled defenseman Jace Coyle from the Idaho Steelheads. Coyle will be the 7th defenseman here in Texas, but he was an essential part of the lineup in Idaho, where the club is suffering with callups and injuries on D.
In a game against the top team in the league, Texas played them tough but ultimately lost to the visiting Oklahoma City Barons 3-2 tonight. The loss stops Texas's streak at two. "I thought we outplayed them and had opportunities," said Coach Pyle. "We played just good enough to lose." Texas went 0/6 on the power play in the game and allowed a PPG goal to OKC. The Stars rallied from down two in the third but couldn't close the gap with the power play goal being the difference. "If we don't give up that third one, we're right back in it." Beskorowany stopped 16 of 19 in the losing effort. Oklahoma City got the first goal of the night late in the third period. Texas would have been first if not for that pesky high sticking rule. An amazing display of hand-eye coordination put the puck in the net from two feet above anyone's head. No goal. Oklahoma City's Tanner House scored on a rebound shot from Hunter Tremblay's point shot, catching Beskorowany sliding right to left. Texas went 0/3 in the first period on the power play and outshot OKC 13-6. Tristan Grant extended the lead on a breakaway goal that beat Besko clean six minutes into the second. The Stars got three more power play opportunities and couldn't close any of them. "We get shots, we're putting it to the net but we've got no finish. When you get opportunities, you've got to bury them." Texas came to life in the third period as Scott Glennie collected his 3rd goal of the year, off a beauty of a feed from Wathier. Dan Spang had the second assist. With time winding down, Ryan Garbutt found himself in the box for tripping an OKC defenseman in the OKC zone. It was a needless penalty as Texas had numbers back to cover. Garbutt was going for the puck in the replay, but that was not the ultimate result of the play. Taylor Chorney scored his first goal of the year on the ensuing power play, setting the score at 3-1. The Stars pulled Beskorowany with over two minutes left in the game to try for the second and third goals. They got one. Matt Fraser had a great shot across the net to find twine on the far side of the goal. His twelfth of the year was assisted by Morin and Spang. Coach Pyle talked a lot about finish in the postgame comments. "We need 50 shots to get 3 goals and that's where we struggle. You're not going to win scoring two goals every night, you're going to need three and four." Both even strength goals were scored against the fourth line (Gazdic-Roman-Schultz): "Our fourth line was minus-2 tonight, we need better effort from those guys. You need more from everybody." Tulupov's misconduct penalty in the first period was incurred after he flipped off the penalty box camera for all to see. The refs caught it and gave him ten. After getting two of three from the #2 team in the conference and Midwest division leading Charlotte Checkers, the Stars' reward is the league leader, the Oklahoma City Barons. "I think we have a little bit of a grudge matching coming against Oklahoma City," said Beskorowany. "They're obviously looking to keep going in first place and they don't want to back down." The grudge match that Beskorowany refers to has to do with the lopsided contests already in the books in the season series between these two. Texas smashed Oklahoma City in the home opener 7-0, scoring four power play goals, stopping six power plays against and earning a shutout for Richard Bachman. OKC returned the favor six days later in Cox Convention Center, blowing Texas away 10-1. Beskorowany officially took the loss, but both tenders allowed five goals each. The two teams haven't played since October 15th, taking much different paths since then. Even just in the last ten, OKC is 8-2-0 and Texas is 4-6-0. Both teams come in on two game winning streaks. Luckily for Texas, OKC is on the last night of a 3-in-3 that saw them in Houston on Thursday morning (kid's game) and back in OKC last night. Ryan Keller leads the Barons in scoring with 9-11-20. Philippe Cormet is just behind with 15-3-18; his 15 goals are #2 in the league for goal scoring. The two are tied for the most game-winners in the league at four each. David LeNeveu ranks #4 in the league in goaltending with a 6-2-1 record 1.87 GAA and .933 SV%. Yann Danis has gotten more starts though and sports an 11-4-0 record, 2.33 GAA and .924 SV%. They are a goaltending tandem that rivals the Charlotte duo for tops in the league and has veteran experience as well. Both broke into the pro ranks eight years ago (03-04) and have played in the double digits of NHL games. Expect Texas to start Tyler Beskorowany again, coming off his shutout performance last night. As far as his move to the starter role is concerned, he is ready. "It's a little bit of a change mentally, but I have to prepare the same way whether [Bachman]'s here or not." Coach Pyle points to Beskorowany as well, "We want Besko to run with it, and we told Spratt may be we give him a start [next week]. Besko's earned it though." Coach Pyle broke down the Stars success against Charlotte, saying that they had a chance to win every game. "I thought we'd been playing really good. We just needed a few saves at times. We needed a timely goal. Timely scoring, good defense." Texas hopes for a little bit of both and some more magic in nets from Beskorowany to post a third consecutive win tonight against the Barons. After two weeks away, the Stars returned to the Cedar Park Center with authority, flexing their muscle to a 3-0 win over the #2 team in the conference. Tyler Beskorowany collected 29 saves in the shutout performance and Texas got scoring from three different lines, including a shorty. "Everybody's clicking from grinders to goal scorers," said Beskorowany. "We had guys blocking shots and clearing out well. We did everything well tonight." The Stars spent the first shift of the game hemmed in their own zone, but then occupied the Checkers' zone for the next four minutes, setting the early game pace. Brenden Dillon got in an early fight after a hit to Dan Spang. "Great team game," said Coach Pyle. "We stuck up for each other." Texas opened the scoring on the penalty kill, their second shorthanded goal in as many games. Francis Wathier deftly put the puck on the stick of a breaking Colton Sceviour for Colton's second of the year. Brad Lukowich collected the second assist. The Stars would take that lead to the first intermission. Just under six minutes into the second, Matt Fraser scored for the second straight game, his eleventh on the season. Wathier again assisted the play, and Dan Spang picked up the second. Texas was up 2-0 and needed to protect that lead. A little bit more insurance came from an unexpected source in the form of Hubert Labrie's first professional goal. Labrie blasted one past Peters for the Stars' third of night at the 7:39 mark. Hedden and Morin assisted the tally. From there on out, it was the Tyler Beskorowany show. Charlotte was held off the scoresheet in large part due to his spectacular night. His best save was in the third period. Already flat on the ice from his first save, Beskorowany reached up with his glove hand to snag the rebound shot out of the air and prevent it from hitting the yawning net. "My parents always told me you've got to be good to be lucky," said Beskorowany. Tonight, he was both. Texas now plays another top team, the Oklahoma City Barons, who are #1 in the league. The last two games between these teams had a combined goal scoring total of 19. Texas came out on top first 7-0, then OKC 10-1. It's going to be a grudge match for sure. The Texas Stars are back in action tonight at the Cedar Park Center against a familiar foe for them, the Charlotte Checkers. Texas has faced the Checkers in their last two games, both in Charlotte, and earned a split on the road. The Checkers meanwhile, stayed in North Carolina for a few more days and played two more against Lake Erie before heading to Texas. The biggest news for the Checkers over the last six days was the recall of half of their dynamic goalie tandem to Carolina. Mike Murphy got the call on Tuesday and even got eight minutes of gametime, ignominiously being the first goalie in history to collect a loss despite not allowing a goal against. The Checkers called up John Muse from Florida (ECHL). Expect to see Justin Peters (6-4-1, 2.32 GAA, .928SV%) in net though. The Stars beat Peters in their last game and he lost against Lake Erie on Monday as well. So how did the Stars beat Charlotte in their last game? For one, the power play started clicking again. Texas had been held to a 3/24 (12.5%) power play efficiency over the previous five games, including three total blankings. The Stars need their power play to work for the team to win. That much has been shown. On the season, Texas is 34.8% (16/46) on the power play in wins and just 17.5% (11/63) in losses. When the PP clicks, they win. The ominous cloud in the room is the home losing streak that the Stars have been enduring. Texas has not posted a home W in over a month, going 0-4-1 in that stretch, last winning against Toronto in OT on November 3rd. Texas also only has one regulation win at home, coming in their first game a 7-0 blowout of the Barons. Further more, Texas is 3-6-0-1 overall at home but 6-5-0-0 on the road. If you flip two or three of those home Ls to Ws, suddenly Texas is in the top eight in the league. The home slide has to stop to keep this team afloat in the West. Emerging offensive play from Jordie Benn has buoyed the Stars despite the loss of power play QB, Philip Larsen. The return of Matt Fraser to the scoresheet after an eight-game cold streak can only help matters as well. The rookie still leads first year scoring for the Stars and ranks #14 in the league. With six days rest coming into the weekend, expect Beskorowany to start both of these games. They are important contests against the #2 and #1 teams in the conference. 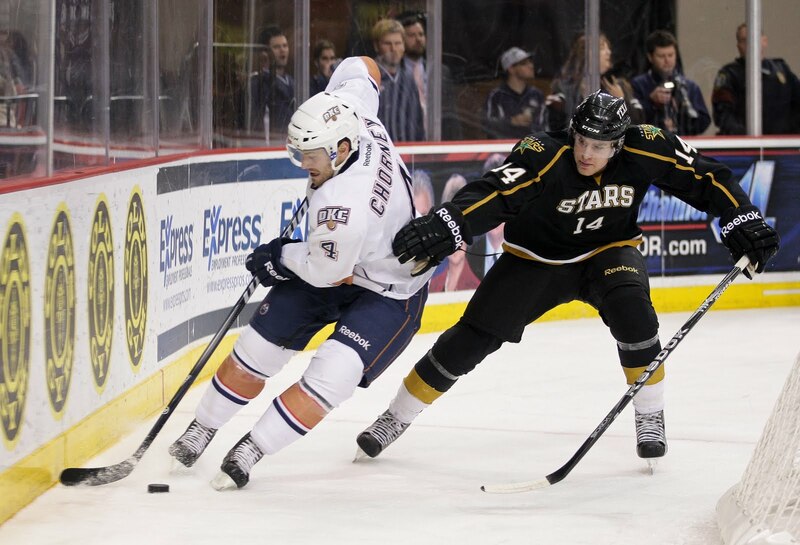 Stars Send Coyle to Steelheads, Possible Larsen Return? Texas announced today that they have sent defenseman Jace Coyle to the ECHL's Idaho Steelheads. Coyle has been the odd man out for the past few games with Hubert Labrie getting starts instead. However, this leaves just six defenseman in Texas. Does this presage a reassignment of Philip Larsen to the Texas Stars with Alex Goligoski and Trevor Daley both close to a return for Dallas? It's very possible. Dallas plays tomorrow and Texas is not in action again until Friday. Idaho plays tonight against Colorado. The Texas Stars announced on Wednesday the club has assigned defenseman Jace Coyle to the Idaho Steelheads, the Stars’ ECHL affiliate. Coyle is in his first pro season, having played in 11 games without registering a point. The 21-year old spent the last three years playing for the Medicine Hat Tigers of the Western Hockey League (WHL). The 5-foot-11, 185-pounder enjoyed his best WHL in 2009-10, setting up 36 goals and totaling 46 points in 68 games played. In 241 WHL games from 2007-11, Coyle scored 25 goals and totaled 107 points. The undrafted defenseman attended training camp with the NHL’s Dallas Stars in 2011 and played for the Stars in the 2011 Traverse City Prospects camp. The Texas Stars (9-11-0-1, 19 pts, #13 Western Conference) hit the road this week for an oddly extended road trip against the Charlotte Checkers (Carolina Hurricanes). The Checkers joined the Western Conference this year to make room for the St. John's IceCaps (Winnipeg Jets) in the East. With the long travel distance, Texas played both of their road games against the club in the same week without any in between. The Stars seem to have made the most of the time off on the road, which is often cited as the place where a group of individuals becomes a team. Brad Lukowich and company enjoyed a Joy Formidable concert on Friday and also tweeted his followers after finding that Luke Gazdic, Ryan Garbutt, and Scott Glennie had left their credit cards at the local Ruth's Chris. It appears Glennie, the rookie, may have "bought" Lukowich dinner that night. Texas managed to send 8,913 North Carolinians home unhappy this evening with a 4-2 come from behind victory. Texas got every kind of scoring with even strength, power play and even shorthanded goals getting the tally to the victorious four. This was a big win for Texas. The lines were slightly retooled, including the power play, which is discussed below. The point here is that Texas can hang with the big boys in the conference, such as Charlotte, and is very close to having something great on the ice every night. Luke Gazdic scored his sixth of the year and his first shorthanded goal to open the scoring in the first. Brett Sutter and the Checkers evened things one minute later and the score was tied after one. Charlotte opened the second period scoring with a goal from Drayson Bowman, unfortunately for Texas a shorthanded goal. Texas then climbed back into the driver seat with two power play tallies. Coach Pyle retooled his power play units to great success tonight. Two of the players changed had goals on the PP. First, Matt Fraser was swapped to the umbrella PP unit, which features one defenseman and four forwards. Jordie Benn stays at the point while the other four spread out in an umbrella formation. Ryan Garbutt lost his spot on the PP to make room for Fraser, who joined Wathier, Sceviour and Glennie. Fraser collected the first PP goal at 14:44 of the second. Newcomer to the power play, Mike Hedden, replaced Matt Fraser on the second more "traditional" PP unit, which also features Dillon, Lukowich, Morin and Sawada. Hedden made good on his PP time, scoring his second goal of the year, the eventual game winner, with four seconds left in the period. Texas added one more in the third off the stick of Maxime Fortunus, his third of the season. Beskorowany had 22 saves on 24 shots in the game. Texas went 2/8 on the PP and did not allow a Charlotte PP goal on 5 tries. No lines tonight, as I couldn't watch or listen live. Note that Hedden started on a line with Morin and Sawada though. Godard was swapped into the lineup for Stephen Schultz. Texas faces the number two team in the Conference once again this evening in North Carolina. Including the last game between the two teams, Charlotte is on a five game winning streak and a six game point streak. Overall, they are 8-1-0-1 at home. This is a challenging team to play against, but this game is winnable. Texas had Charlotte. If you thought Texas might get a reprieve in net with Mike Murphy not starting, Justin Peters was just named the Goalie of the Month for November. No such luck. This is going to be a hard battle and the Stars will play Charlotte again at home next Friday. Watch for bad tempers to boil over next week if this one is an out of hand L either way. Just a quick note today that Michael Neal was returned to Idaho today by Texas. 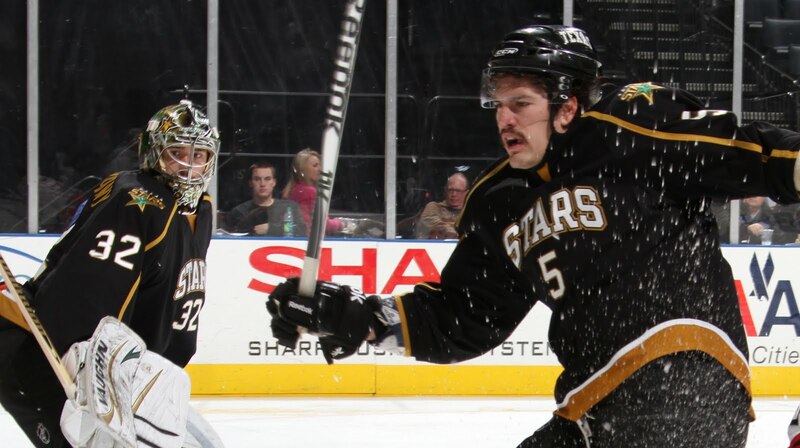 The Stars called up Neal when Francis Wathier was called to Dallas this past Monday. Wathier was returned Tuesday, thus eliminating the need for another forward in Austin. Neal did not play in the Stars' game against Charlotte Wednesday. Texas is in action again on Saturday. 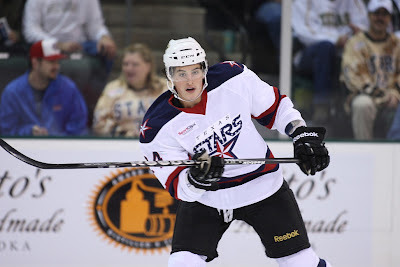 The Texas Stars announced on Friday that forward Michael Neal has been assigned to the Idaho Steelheads, Texas’ primary affiliate in the ECHL. Neal was recalled on Monday, but did not see action with the Stars on his recent stint. He is in his third season within the Dallas Stars organization. The Whitby, ON, native has played 22 games with Texas over the previous two seasons. During his time in Texas, the forward has three goals and 14 penalty minutes. The 22-year-old played in 19 games with Idaho this season, totaling three goals and seven points. For his career, Neal has played in 144 pro games with Idaho and Texas, scoring 17 times and totaling 40 points. He was drafted by the Dallas Stars in the fifth round (#149 overall) in the 2007 NHL Entry Draft. I am continuing my regular appearances on the KTIK Steelheads Hockey Show in Boise with another interview tonight. With the callups around the team, we are sure to discuss Tyler Beskorowany's development as well as Hubert Labrie, Ondrej Roman and other former Steelheads. I will appear on this evening's program at 6:20 Mountain/7:20 Central on AM 1350 in Boise. You can listen online by following this link and then selecting the Idaho Steelheads logo. Despite a recent 30 day reprieve, the closure of the Chaparral Ice rink of I-35 still looms large over the Austin hockey community. Among adult league players and parents of youth players, rumors have swirled about the construction of a new rink, to be built by the Austin Hockey Group. To dispel any incorrect rumors and get the facts straight and out in public, 100 Degree Hockey interviewed the president of the Austin Hockey Group, Corky Brown. Austin Hockey Group President Corky Brown is very clear on the goal of his organization. Corky Brown is not a newcomer to hockey in general or in Austin. He played for the USHL’s Dubuque Fighting Saints from 1988 to 1990. After his playing career was over, Brown moved on to coaching, becoming a master level coach for USA hockey and coaching instructor for the Central Texas region. He is Executive Director of the Austin Youth Hockey Foundation and coaches the America’s Showcase High School All-Star team in Pittsburgh, PA, yearly. In addition, he has 49 goals and 76 assists in just 87 games played in Austin’s amateur league. The credentials are there. For Brown, growing up around the rink meant a sense of community and togetherness through hockey. The Austin Hockey Group hopes to accomplish that with their new rink. Original plans by the group to buy Chaparral Ice eventually failed, leading them to look for a location for a new rink in Austin. Despite some rumors to the contrary, they have not changed their mind on this point. In the interim, many adult players have joined the newly formed Austin Hockey Club with games to be played at the Cedar Park Center. The newest schedule of games at the rink will begin next week. The top tier amateur league has already played in the facility since ice was put down this fall. While the Texas Stars are not in any way partnered with the group in their pursuit of building a rink in Austin, “The Stars and [Stars president and CPC GM] Rick McLaughlin have been incredibly gracious (in the process of setting up the CPC league).” The Stars clearly recognize the importance of keeping hockey alive and well in Austin. Brown believes that is the goal of everything that his group is working on.